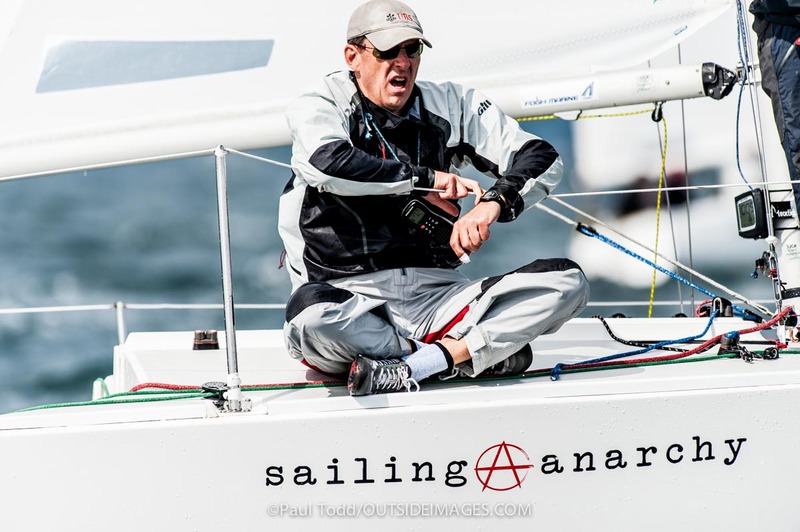 It wouldn’t be a J/24 Worlds without controversy, with Helly Hanson and several other top teams getting redress/AVG for their black flag DSQs while others didn’t after a marathon multi-day protest bonanza. Check the thread over here for protest forms and jury decisions, and thanks to Paul Todd/Outside Images for the great shots with a massive Day 3 gallery here. We had an on-time start on Wednesday for three scheduled races thanks to an unpredictable forecast for Thursday. Another gorgeous Newport fall day on the ocean course, with wind at 75 true on the way out and 90 soon after passing R4. 12 knots with trending right breeze and the RC again had a hard time lining the three-boat startline up. Around 1230 we went off with a few U flags awarded. I have no idea what a U flag is but I’m happy we didn’t have to learn it. We again had to tack to port and duck a couple of boats, but within a few minutes of the start we were going to the right with a great lane and following our game plan. We got a nice right shift, tacking over together with Helly Hanson and Will Welles. It looked great under the boom (though I’m no longer allowed to look under the boom) until only one boat crossed…and tacked on our lane. Two tacks and a new layline was expensive, and we lost out to everyone leeward who didn’t need to tack. And of course the left came in strong at the final approach. And of course, we round in about 10th – again! I don’t understand why gybing immediately at the offset under this big fleet has been working consistently but Mauricio won the race doing the same thing and HH got into second. Travis Odenbach had a great race to take 3rd; we stayed only long enough to clear the fleet and then gybed, but it was too late – we lost ten boats in that one and had to play catch up again. 17th place. The second race started in a bit less breeze and we were happy to have eased the rig at the last minute. Best start of the regatta for Clear Air, a neat split in the fleet, and we got to go straight for the longest we have all week. We worked the left and looked great until the right shift came back, and the port side caved. Travis had it right again and led around the mark with Welles second, with the rest mixed up. We rounded in…wait for it…tenth again. Not bad for being on the wrong side, but most amazingly, the leaders from both sides converged at the weather mark bow to bow in both races! The one time gybing on the mark didn’t pay, and the boats that stayed on starboard had a nice lead at the bottom mark. Some passed us. It is time for us to get a break! 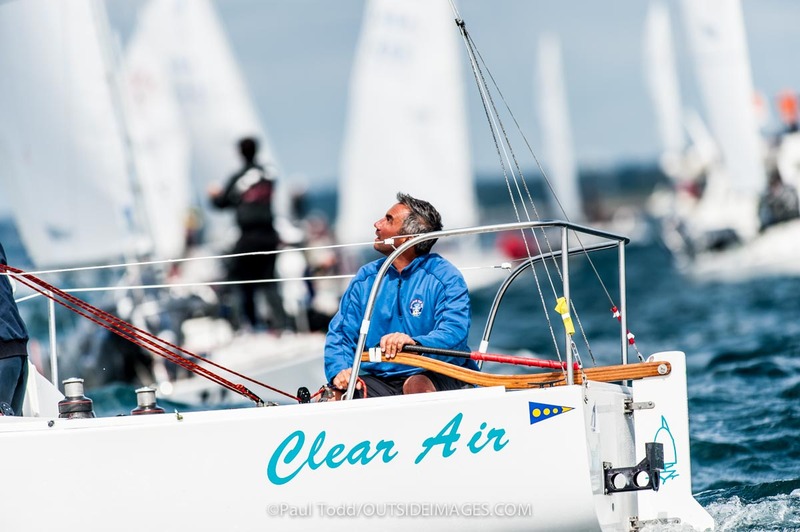 The wind kept tracking right and the second and third upwind was pretty one-sided, Odenbach again played the right and won by a good distance over Alejo from Argentina and Mike Ingaham. Will now has a nice little lead cushion against Muauricio in second. Team Tarheel consistently strong and comfortably in third. I have not seen this many letters on a scoring sheet before. Many boats are dropping DSQ/BFDs (or U flags) and scoring penalties; forecast is changing fast from light to windy with gusts into the 20s for Friday. Stay tuned for more action from the course. Huge thanks to Lavalife.com, Sailing Anarchy, and DryUV for their support in our quest, and an even bigger thanks to our hosts Adrian and Matthew Buechner and the many families in Newport that embrace sailing and have put J24 teams in their houses. You have made the Worlds experience possible for many sailors.